Forest Grove Fire Co. of Franklin Twp. 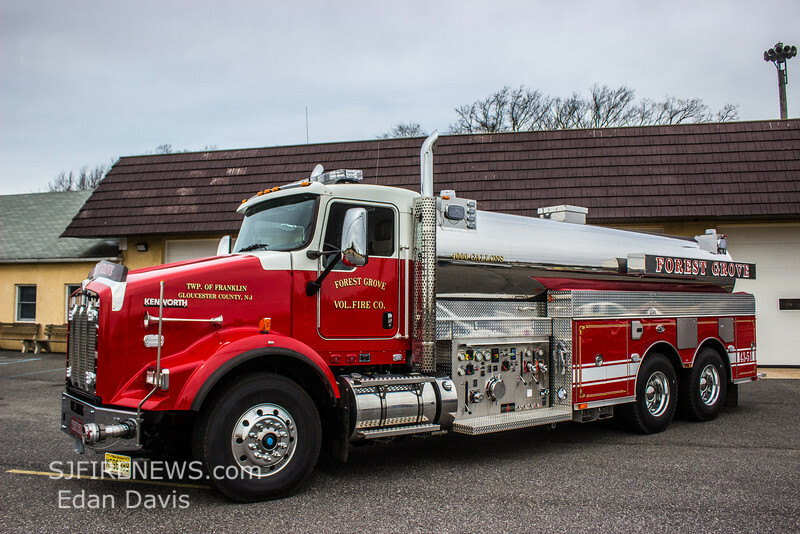 (Gloucester Country NJ) has placed in service this 2014 Kenworth T800 / Sutphen and Tender 43-51. The new Tender is equipped with a 1500gpm Hale Side Kick pump and holds 4000gal of water. The new truck is also equipped with a 500 hp Cummins engine, front discharge, right side four-inch discharge, electric dump vales on sides and rear, stainless steel body, LED warning light package, LED scene light package, hose beds on each side above compartments and custom SCBA compartments in wheel wells. SJFN would like to Congratulate the Forest Grove Fire Co. on the new addition and wish them many great years with the new piece.